On February 9, 1973, the trustees of Case Western Reserve University approved the renaming of Adelbert College, Flora Stone Mather College, and Cleveland College. The new name chosen was Western Reserve College. 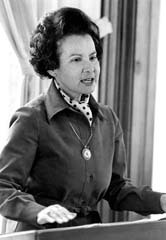 On January 12, 1973, the Flora Stone Mather Alunnae Association had passed a resolution in favor of the name change and recommended an endowed chair in honor of Flora Stone Mather. 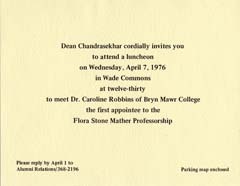 At the February 9, 1973 trustee meeting, the Flora Stone Mather Professorship was established. A fundraising campaign to raise $1,000,000 for this chair was undertaken by the Mather Futures Committee, the Mather Advisory Council, the Mather Alumnae Association, the Honorary Committee for the Mather Professorship, descendants of Mrs. Mather, and Mather alumnae and friends. The Mather Alumnae Association made a gift of $100,000 for the Professorship. This was to be a visiting professorship rotating among the departments of Western Reserve College whereby academicians of distinction in teaching, and scholarship would visit campus for a year. Until the endowment reached its full amount the visiting professor stayed on campus for shorter periods of time. Caroline Robbins was the first Mather Professor. She was on campus April 4-11, 1976. By 1977 there was enough income to have a visiting professor for a semester and Emma Lou Thornbrough was the 1978 Mather Visiting Professor, teaching in the Department of History for the 1978 Spring semester. In 1978-1979 Lilian Furst was the first full-time appointee for an entire academic year.